Looking around a decimated planet, Nova confirms with the WorldMind that they have landed on Kvch. The artificial sentience tells Nova that they are on the correct planet and it hasn't detected any lifeforms anywhere. Rich Rider is stunned with the realization that they may have come such a great distance to only find failure in his quest to save the Kree people from the Phalanx. Suddenly, the WorldMind detects movement twenty-eight kilometers away and Nova immediately flies to investigate its source. The young Earthman slides to a complete stop as he comes face-to-face with a giant mechanical monster! Nova instructs the WorldMind to attempt to make contact with the being. Following a series of audio, microwave and digital pulse signals, the robotic lifeform turns towards Nova. Suddenly, it finds itself blasted by a set of blast beams from another mechanical construct! The attacker turns its attention to Nova and begins blasting at him! The Earthman evades the beams but he finds himself in severe pain as the Phalanx transmode virus becomes extremely aggressive. The WorldMind deduces that the proximity of the mechanoids is causing the virus to react violently. As Nova tries to get away from the robotic lifeform, the virus erupts from Nova's body and begins to consume him! Unexpectedly, one of the mechanoids stops and orders the other to halt its attack. The construct recognizes that Nova is human and comes to his aid. Suddenly, it takes its true form and becomes Warlock! Later, Rich Rider regains consciousness and the WorldMind reboots its internal systems. Warlock checks in on Nova as the WorldMind feeds information about their ally to Rich's visor. Nova recognizes him as Warlock from the New Mutants and a member of the Technarchy species. The infected human asks his new companion for help to cure the transmode virus. Warlock explains that he was able to boosts Nova's energy level but cannot help him find a complete cure. When Nova asks why, he explains that he is trying to save the Technarcy race from self-extinction and cannot fight against the Phalanx too. As they journey towards Warlock's destination, the former New Mutant gives Nova some background information on the Technarchy. He informs his human friend that the Technarchy goes from galaxy to galaxy absorbing the 'lifeglow' energy from organic lifeforms. A by-product of their consumption is the Phalanx. The Technarchy itself is a violent race with the parents forcing their offspring to fight them for the right to survive. It's this path of self-extinction that Warlock is determined to end on Kvch. As they arrive at the Creche Terminal, Warlock continues the Technarchy's story. All of the mature Technarchs have left the planet in search of lifeglow but their offspring continue to inhabit Kvch. As they talk, the second robotic lifeform arrives but is back in its natural mechanical form. Warlock introduces Nova to Tyro. Tyro is revealed to be an adopted son to Warlock. The former New Mutant is a mutant and has a rare non-aggressive form of the transmode virus inside him. He has introduced the mutated virus into Tyro in an attempt to remove the species natural aggression.Rich admires Warlock's mission but argues that saving the entire Kree race is more important than a single being. Warlock counters that he does not have the lifeglow resources to save the Kree race and that it would take vast amounts to do so. Kilometers away, Gamora and Drax have teleported themselves to Kvch in their quest to kill Rich Rider. Suddenly, their transmode viruses explode outward and mutate their hosts into a Babel Spire which begins transmitting a signal towards space! Back at the terminal, Warlock continues his story with Nova. He informs his new friend that his mutated virus allowed him to be non-aggressive which led to his joining the New Mutants on Earth. Warlock reveals that the team fought off Warlock's father/siredam when he came to Earth to destroy his offspring. Tyro is disgusted that Warlock would ally himself with human lifeforms. Nova takes offense to Tyro's term of 'meat thing' and approaches Warlock's adopted son. Before a conflict begins, Warlock intervenes and scolds Tyro for his comments. Warlock continues his conversation and explains that he has taught Tyro that lifeglow cannot be taken from one lifeform to save another. However, Warlock has been teaching Tryo how to fight so he can protect himself when Tyro's siredam returns to Kvch. Nova continues to argue that the fate of the Kree is more important than saving only a few Technarchy. Warlock asks Nova which race he would save if he could only save Earth or the Kree. 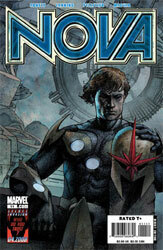 After a few moments of reflection, Nova admits that he would save Earth. Rich Rider decides to leave the terminal and head towards the surface. Before he can take off, Tyro violently reacts to the signal sent from the Gamora/Drax Babel Spire! Nova and Warlock analyze the data coming from the spire and realize that a fully mature Technarch has arrived on Kvch!